What's the concept of the new show? What can we expect? It started with a commission from a Spanish contemporary art museum called MUSAC, together with indie-rock festival Benicàssim, which I documented extensively this year. And the title, Perfect Stranger? The recognition of a total stranger in a crowd—like a déjà vu, a movie close-up or the description of a character in a novel. I've spent my life documenting perfect strangers. It is also about the construction of an icon, the making of faith and the illusion of community—therefore, the illusion of the live performance and its promises. Is curating a solo show more challenging than a group show, such as Sweet Bird of Youth? I am not really into group shows, I have to say. I only did them because they were kindly proposed. They are only interesting to me when it is a full commission of new works, which is difficult to achieve, and there is the same level of commitment and consistency among the artists. Solo shows are more straight-forward. I can keep working on them until the last minute without any kind of personal issue. Your clothes may have gone, but your ideology remains, perhaps even stronger now, without the hedonistic transience of the fashion cycle. Would you agree? Do you feel liberated in that way? Yes, I agree with that. And that is precisely what I was trying to express for the past ten years, really. It is always about describing the same energy and idea, what you call an ideology, through any possible creative field. Fashion is one of them, but not the only one. Therefore, I don’t think there is any kind of rupture at all, just the reconfiguration of a system. Besides, there is now a distance, and maybe to others things can be seen with perspective. How do you wish your work at Dior to be understood? I don’t really know, that may be presumptuous to do. The thing about those last years is that any kind of exploration was done from the inside, with full commitment, in the most organic way, no matter what it took. Until now, it appears that I have been defining my commitments little by little, tempted by this idea of "intentionality." On the other hand, I have always left things to happen intuitively, within something like a strong faith, beliefs and fatalism. In a way, the generation you helped recognize is left without a champion. How do you feel about that? I totally trust they are creatively aware and fully committed. It is the most exciting thing for me. I also trust they know better, already defining the rules. The fact that other generations are glued to their chairs and resisting is irrelevant. It’s going to happen. You’ve been photographing from a young age and you’ve built up a considerable archive. Are you a nostalgic person, or do you fight against it? I fight against it. Suddenly, and for many reasons, I had to look past my pause in fashion, which I never did before, and look at my photographic archives, which made me feel melancholic. The archives are people I loved, kids I photographed, musicians I worked with and followed through their emerging years. Now I have a 20-year archive of photographs and millions of portraits and stories. It feels overwhelming sometimes. This year has been another prolific one for you. Are you irritated by idleness? It has been a really interesting year, in which I made a clear decision to protect my desire to make things, without getting trapped in conventions. I wanted to get beyond speculation, as well as dodgy political and personal agendas. I wanted to stay free of my choices and stop everything for a while. My photographic projects were postponed during my days in fashion, when time was an issue. Eventually, the end of the Dior Homme project had no consequence at all on what I am doing. I stayed on track no matter what. What other projects do you have coming up that you can tell Hint about? I have a couple of other shows coming up, one in Tokyo in early February at Koyanagi gallery, which will be a pleasant moment for me. I really love Japan, and I haven’t been for a while. I also have this museum show coming up in Spain and two books to be published. Music is a central part of your universe. What bands are you into at the moment? Have you ever thought about setting up a record label? Well, this is a good question. I find bands that other people signed, and that is okay for me. But doing the creative direction of a new label could be interesting, although it is a full-time job and I’m not sure I want to give up anything else for it. As for bands, there are a couple of interesting ones. 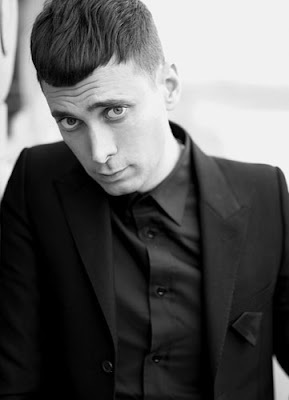 I’m still totally behind These New Puritans, who did my last show and were partly on my team at Dior. I also like very much the singer of Answering Machine and a young British band called The Metros. Finally, I have to ask, will you ever return to fashion? Will you make clothes again? Yes, totally, I assume in 2008. I don't want it to consume my life, but I would miss not doing it, especially the fabrics and the atelier. It is part of my life, and collections keep running through my head. It simply has to be the right project. Will we see Hedi's new collection in 2009? ?